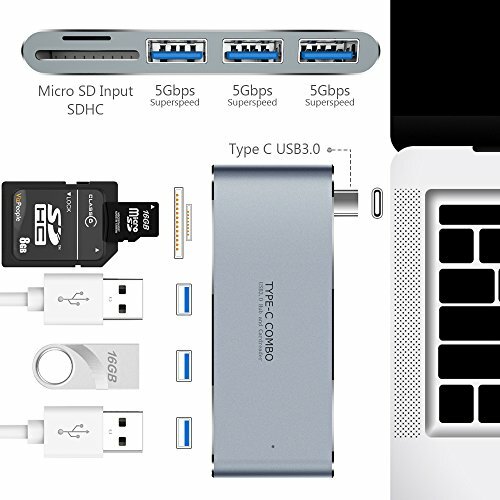 1.【Expand your Type-C port】This USB C hub is designed for new Type-C products, including new 12\" MacBook, MacBook Pro 13\", MacBook Pro 15\" and other USB Type C devices like Chromebook Pixel. 2.【Multi-use and Convenient Charging Hub】The slim type-C USB 3.0 hub with multi 5 ports, 3 USB 3.0 ports, a micro SD and a TF/SD card slot. It can be able to connect all USB C devices, such as scanners, digital cameras, thumb drive, U disk, keyboard, mouse, mobile phone etc. It\'s capable of charging devices and transferring data at the same time. 3.【Portable and Slim Design】Incredibly compact size( 3.55*1.35*0.43 inches) and net weight is about 1.39 ounces. Without any cable, the USB C adaptor is easy to use and carry along in your laptop sleeve providing you extra ports when you need. Plug and play, does not require any software, drivers, or complicated installation process. 4.【Aluminum Alloy Design】The type C hub offers a good quality visual effect, the aluminum alloy case is comfortable and smooth hand feeling. It was born for MacBook that is in accordance with the metal casing of MacBook. Seamless interface, good quality and perfect texture. 5.【Guarantee】1 year warranty and provide friendly, easy-to-reach after sales support.